The SNP has today launched a new initiative tasked with encouraging a greater number of black, Asian and minority ethnic people into political decision making in Scotland. Transport Minister Humza Yousaf MSP and Scotland’s first female Asian MP Tasmina Ahmed Sheik will co-chair a taskforce to explore the barriers facing those entering politics and public life, with a view to overcoming those obstacles. Their work will include establishing a new Bashir Ahmad Scholarship programme, launched today at the SNP Equalities Day, which brings together conventions for black, Asian and Minority Ethnic members, LGBTI+ members, and Disabled members at the SECC in Glasgow. The scholarship, named in memory of the late SNP MSP Bashir Ahmad, will provide political mentoring and internship opportunities to Black, Asian and Minority Ethnic members of the SNP. Bashir Ahmad made history in 2007 when he was elected as a Member of the Scottish Parliament, representing Glasgow on the regional list. 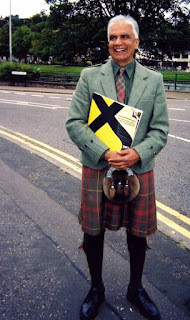 He was the first Asian-Scot and non-white parliamentarian to sit in Holyrood. Bashir died in February 2009. "I am proud to lead a party that celebrates the diversity of our nation. From Bashir Ahmad, the first minority ethnic Scot elected to the Scottish Parliament, to Humza Yousaf, the first minority ethnic Scot appointed to government and Tasmina-Ahmed Sheik, the first minority ethnic woman elected to Westminster from Scotland, it is the SNP that has led the way in making significant cracks in the glass ceiling. “However, we must go further. The Scottish Parliament, Westminster and our council chambers must reflect the multicultural tartan of Scotland. I want our party to not only celebrate diversity but actively ensure we reflect that diversity. “The Bashir Ahmad Scholarship programme will provide political mentoring and internship opportunities to Black, Asian and Minority Ethnic Scots. “And I have asked Humza Yousaf and Tasmina Ahmed Sheikh to co-chair a working group on behalf of the SNP to explore the barriers facing those entering politics and public life, with a view to overcoming those obstacles. “The SNP is committed to a wholly inclusive Scotland – whether you are from Pakistan or Poland, Ireland or India, the SNP wants you as part of our movement. "Without the vision and drive of the late, great Bashir Ahmad I simply wouldn't be in the position I am in today. His efforts made it possible for me, and hopefully a future generation of minority ethnic Scots, to get involved in politics. However, it would be a mistake to think the job is done, as a nation we need to be more representative of Scottish society in all layers of our political system. "I am delighted that the SNP has launched the Bashir Ahmad Scholarship and it is a real pleasure to co-Chair the Working Group to look at how we can make our party more reflective of Scotland's multicultural landscape." “The SNP has equality at its core. We are an inclusive, socially progressive party, with a forward-thinking membership. “Achieving a proper balance of candidates and elected representatives who are fully reflective of all those we seek to represent, is a process and not an event. It takes time, effort and planning to deliver this kind of positive advancement.